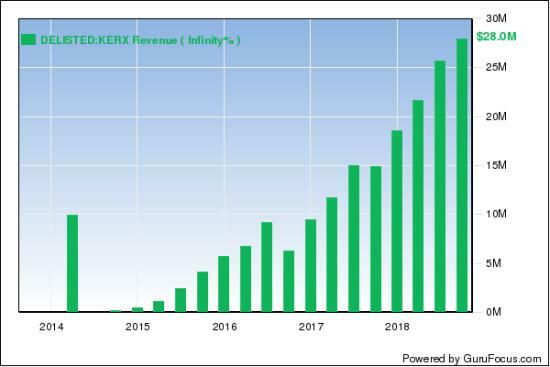 Legendary investor Seth Klarman (Trades, Portfolio) disclosed Thursday that his long-term stake in kidney care company Keryx Biopharmaceuticals (KERX) closed as it converted into a stake in Akebia Therapeutics (AKBA) upon the merger of the two companies. Warning! GuruFocus has detected 2 Warning Signs with TBPH. Click here to check it out. Klarman's Baupost portfolio contained 25,791,678 shares of Keryx at third-quarter end, equating to a 21.4% stake in the company. The value investor bought the position over 2014 and the first half of 2015 at lofty prices averaging around $10 to the mid-teens. Its price then dropped around 68% from June 26, 2015, to $3.36 on its final trading day. Akebia and Keryx announced their all-stock merger on June 28 with the unanimous approval of both of their boards of directors. The combined company will focus on chronic kidney disease, uniting Keryx's Auryxia (ferric citrate) treatment for hyperphosphatemia (high phosphate levels) in dialysis patients and iron deficinenty anemia in non-dialysis patients with Akebia's Phase 3 oral anemia treatment, vadadustat. Together, the company's offerings will treat patients at varying degrees of chronic kidney disease. Klarman's Baupost voted in favor of the merger, the company said in a statement. "The strategic and financial drivers of this merger are compelling. The combined company will have an expanded and highly complementary nephrology portfolio, with Auryxia, a product with significant growth opportunity, and vadadustat, an investigational late-stage HIF-PHI that has the potential to provide a new oral standard of care to patients with anemia due to CKD," Akebia president and CEO John P. Butler said. Back in 2016, Klarman said in a shareholder letter that although he overestimated initial prescriptions for Auryxia, he remained confident in the "long-term potential" of the treatment and held onto the stock. "The market, however, took a much harsher view and punished the stock, driving it down to almost 70% in less than three months from about $10 to almost $3 a share," Klarman wrote. "Although this certainly was not good news for our mark-to-market P&L, we believe it was a significant overreaction, and we were able to take advantage of the opportunity by investing additional capital on a private basis at what we believe is an incredibly attractive valuation." Klarman has earned a reputation for generating high returns by buying shares of undervalued companies. The health care sector has long featured prominently in his strategy, ending the third quarter at 19.6% of his Boston-based Baupost Group's common stock portfolio, an increase from 18.5% in the previous quarter. His portfolio's largest health care positions are Allergan PLC (AGN) at 7.4%, Theravance Biopharma Inc. (TBPH) at 2.39% and McKesson Corp. (MCK) at 2.27%. See Seth Klarman (Trades, Portfolio)'s portfolio here.